Montessori of Alameda is a bilingual preschool and kindergarten offering Montessori programs for infants and children from three months old to six years old. Our goal is to help children master their intellectual and social skills while developing positive self-esteem and confidence. As a Member School of the American Montessori Society (AMS), we provide an authentic Montessori experience to all of our students, making our school the perfect choice for families in the Portland community. 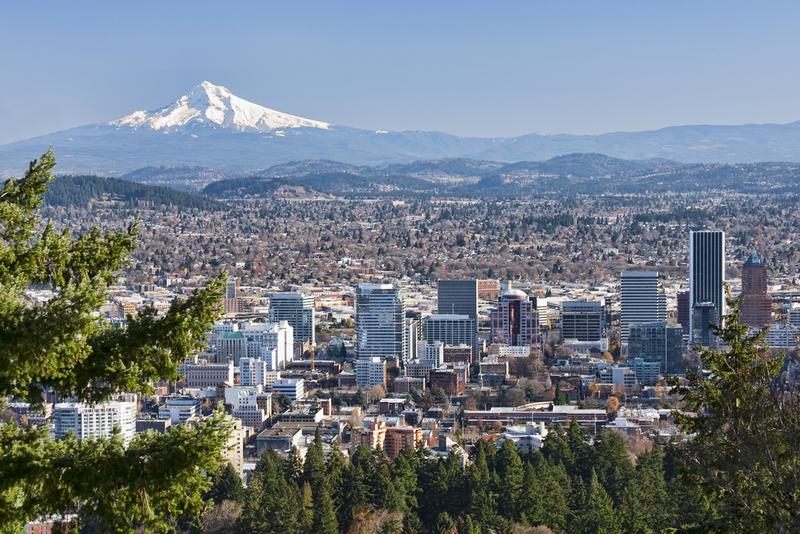 Portland is the largest city in Oregon, covering 145 square miles with a population of around 650,000 people. Known as one of the world’s most environmentally conscious cities, Portland has extensive public transportation options and over 10,000 acres of beautiful parks. Portland is also often called the “City of Roses” because its warm summers and cool winters make it the perfect climate for growing roses. There is no shortage of exciting local attractions in the city. The Oregon Zoo, founded in 1888, is the oldest zoo west of the Mississippi River. Spread out across 64 acres, this zoo has more than 1,800 animals, including elephants, polar bears, lions, cheetahs, monkeys, and penguins. Visitors can also go on special behind-the-scenes tours and experience the animals up-close through the zoo’s animal encounter program. For visitors and residents who would prefer a peaceful afternoon, the Portland Japanese Garden is the perfect destination. This garden is 12 acres of beautiful flowers and authentic Japanese tea houses. There are also koi points and lanterns scattered throughout the garden, as well as a Cultural Village with a Japanese Arts Learning Center. Families will enjoy going to the Portland Children’s Museum, located in Washington Park. This museum has tons of interactive and educational activities perfect for young children. The building is broken down into different exhibits, such as Theater, Pet Hospital, Water Works, and Clay Studio. Portland residents also have the option of signing their children up for extracurricular classes including cooking and art. At Montessori of Alameda, we create a partnership between our students and teachers to ensure that every child is successful. We believe that every child is unique and deserves a learning plan that is tailored to his or her individual strengths and weaknesses. Children in our loving and supportive classroom environments learn social skills, conflict resolution, and problem-solving techniques. Each classroom is full of developmentally appropriate and authentic Montessori materials that capture students’ interest. We understand the importance of developing healthy, well-rounded students. Our campus includes playgrounds, gardens, and a covered sports court, which provides many opportunities for outdoor play and exploration. We also play music everyday in our classrooms and students participate in poetry and storytelling sessions. Montessori of Alameda is less than a 20 minute drive from Portland International Airport. To leave the airport, continue straight on NE Airport Way and then make a slight right toward NE 82nd Avenue, where you will pass a 7-Eleven. Head south on NE 82nd Avenue until you reach NE Prescott Street, where you will make a right. Continue on NE Prescott Street, passing the AutoZone, until you reach NE 42nd Avenue. Make a right onto NE 42nd Avenue followed by another right onto NE Going Street. Montessori of Alameda will be on the right hand side. Downtown Portland is less than a 20 minute drive from Montessori of Alameda. To get to Downtown Portland from Montessori of Alameda, head south on NE 42nd Avenue, make right onto NE Fremont Street after passing Beaumont Middle School, and then make a left onto NE 33rd Avenue. Head south on NE 33rd Avenue, passing Grant Park and Beverly Cleary School, then use the right lane to take the Interstate 84 W ramp and continue on the Banfield Expressway, passing Sullivan’s Gulch and Benson Polytechnic High School. Use the left two lanes to take the exit toward City Center and continue onto SE Morrison Bridge. Then, use the right lane to take the Naito Parkway S ramp to Interstate 5 S. Continue on Pacific Highway W until you see the Marriott on your right hand side and Tom McCall Park on your left. A final right onto SW Clay street will take you into the heart of Downtown Portland and you will see the beautiful Keller Fountain Park on your left.